Mention Put-in-Bay, Ohio, and, more likely than not a naval or military historian will recognize the place before a motorsports enthusiast does. It was here, in September 1813, that an important—and unexpected—naval victory was won by Commodore Oliver Hazard Perry for the US side during the War of 1812 against the British. There’s also an aviation chapter that brings the area to mind. Island Airlines used three Ford 4-AT-B “Tri-Motor” aircraft to fly passengers and mail to the cluster of islands in Lake Erie off the coast from Port Clinton, located just outside of Sandusky, with the planes making stops on South Bass Island (where Put-in-Bay is located), Middle Bass Island, North Bass Island, and Rattlesnake Island. 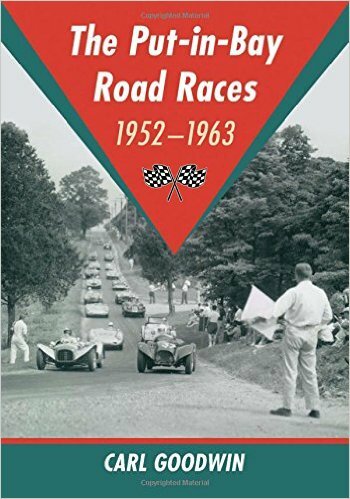 But it is the sports car races that were once held on the streets of Put-in-Bay many years ago that this book is about. Using both the material he gathered for several magazine articles on the races and extensive interviews with the participants, Goodwin provides a look at the races held here from 1952 to 1959 as well as the final, “secret” event held in 1963. Goodwin sketches out the background to the races, describing how members of the newly-formed Cleveland Sport Car Club came up with the idea of a road race and actually managed to bring it to fruition despite the usual trials and tribulations associated with such enterprises. Although a contemporary of other road racing venues such as Watkins Glen, Pebble Beach, Bridgehampton and Elkhart Lake, the Put-in-Bay races have largely been forgotten or relegated to footnotes because the organizers had placed such restrictions on the sort of cars that could compete there. The maximum displacement limit was two liters which meant that marquee names such as the Cunningham team that ran large-displacement American-engined cars, or the big-bore C and D Type Jaguars never competed here and left it to the locals to slug it out. Goodwin covers the events of each year with background to each race weekend, a detailed report on each, and discusses the entries and results. The 1963 race, which Goodwin calls he “secret road race,” is even more of an oddball. The book is well illustrated, profusely so, in fact. Many of the photographs are being published for the first time, offering a fresh look into an era that has long since faded from memory. In some ways, the photographs themselves alone almost justify placing Goodwin’s book on the shelf—even if, in this publisher’s typical approach, they are small and b/w. I doubt, for instance, that I’ve ever seen a photo of the John Allen special that ran in the H-Modified event in the 1956 race weekend. Also, I was rather taken by the photograph of the Berkeley (with a fairing for the driver that I had not seen before) entered by the Funny Face Auto Racing Team in 1959, running in J-Production, no less. These are just a few of the photographs that caught my attention, along with a Kieft sporting an eye-catching checkered livery in 1954, or the Simca being pursued by a Siata and pack of MGs or that of the Cisitalia taking a corner in 1953. For those folk Goodwin deems “special contributors,” brief biographical sketches are provided. Their focus is on those who provided many of the photographs used here. There is also a listing of all the interviews and correspondence that Goodwin conducted in the course of researching the book, as well as an extensive bibliography covering the sources he used in his research. The inclusion of these materials is especially noteworthy given that such information is too often omitted, leaving the well-read reader guessing. Although Goodwin does not use citations (foot- or endnotes) in this book, it appears that most of the anecdotes he uses are attributable to the individuals discussed in the text. While a seemingly small point, this is the sort of attention to detail that few enthusiasts or hobby historians bring to their work. While certainly not a scholarly monograph—and not intended to be one—the book is definitely a step above what might otherwise be expected. For this alone, Goodwin and his book deserve a good measure of praise. In period, the Put-in-Bay races may well have been of mainly local interest but today our appreciation of past events and their role in the larger scheme of things is far more sophisticated. One hopes that Goodwin and others might begin to tackle other similar topics from this era and provide us with the fruits of their research.